With the latest update, you can use the driver-optimized interface right on your phone or tablet, with no special car hardware necessary. 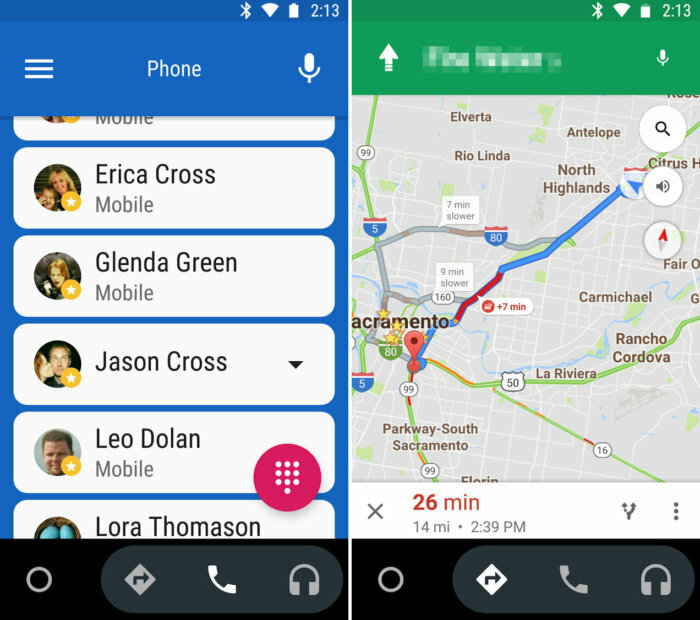 Back in May, we gave you an early look at Google's work to put Android Auto interface right on your phone. Today, the company makes good on its promise to release the new one-phone experience "later this year." With the latest update, you no longer need an Android Auto compatible infotainment system. All you need is your phone. You have, of course, always needed an Android phone with Android Auto running on it. You would plug it into your car via USB and then your infotainment system would show the interface, but use your phone's data connection and information to play music, send texts, navigate via maps, place phone calls, and so on. For a lot of users, that's no good. Yes, a large and growing number of cars support the standard. But people don't go buy a new car every year. And you can't always just plop in a new infotainment system. Consider my case: I drive a Prius. Toyota is invested in its own Entune software, and supports neither Android Auto nor Apple CarPlay. And it's a lease, so I can't just go hacking into my dash. Calls, maps, music, and more. It's all there, in a very driver-friendly interface. But I use my phone in the car all the time. I mount it to a bracket that clips to the A/C vent, and I use the Bluetooth connection to make calls, listen to music, and get Google Maps navigation. It's great, but it's hard to to use while driving. That's where this new update really makes all the difference. After giving the new Android Auto app a huge host of permissions (it needs to make calls, send texts, get your location, play music, and so much more), I was given the option to have the app automatically launch when it connects to my car's Bluetooth. After that, it all seemed very familiar. The on-phone experience is not exactly like the in-dash one, but close enough. It assumes you've got a smaller display, and doesn't want to overwhelm you with quite as much stuff to tap on. And of course you can't control it with buttons on your steering wheel. Both portait and landscape modes are supported, so mount your phone however you like. But all the main features are there: Maps, directions, and traffic. Making calls. Sending texts by voice. Listening to one of the many supported audio streaming services. You could do this stuff with your phone before, but with Android Auto it's all pulled into a cohesive, driver-friendly interface that sticks to a small number of large touch targets. You know, so you don't kill yourself trying to start up your favorite road trip playlist. 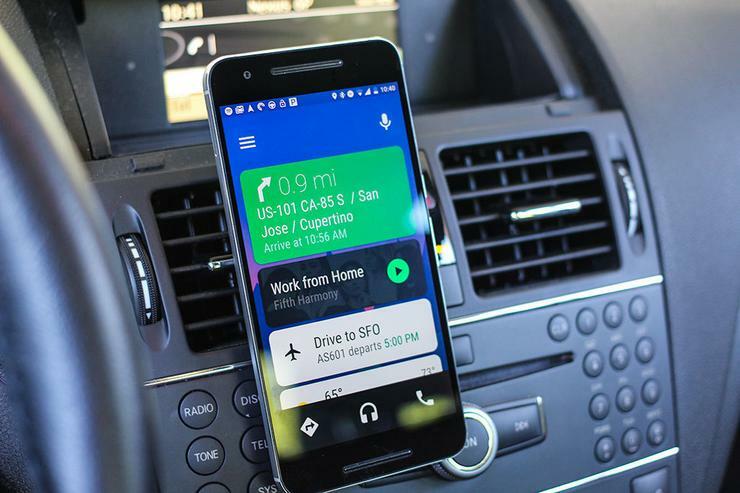 The list of apps that support Android Auto has grown quite strong. The real downside has been the difficulty of getting it in your car. Now that you get the driver-friendly interface right on your phone, the app really is worth picking up for nearly everyone who drives. There's no split in app support with this new version—all current Android Auto apps are supposed to work just fine, and developers don't need to do anything in particular to support the on-phone experience. Not everything is quite as perfect as we would like it to be, though. Using "OK Google" voice commands isn't yet enabled, and will come in another update over the next few weeks. 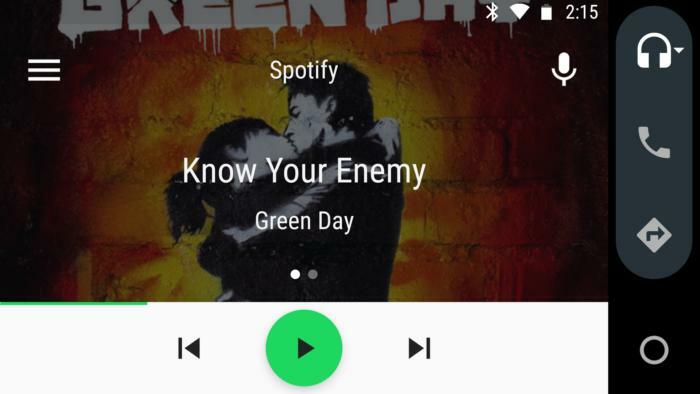 There's an ever-present microphone in the top right; you'll have to tap that to give Android Auto a voice command. Once you do, all the voice commands that work on the in-dash experience appear to work here. Now that you don't actually need a car, I can see Android Auto being useful for other types of users. Bicyclists who mount their phones to their handlebars, for instance. Pair it with a Bluetooth speaker and use it on your boat...you won't find nautical "traffic" reports but the rest of the features might prove useful.